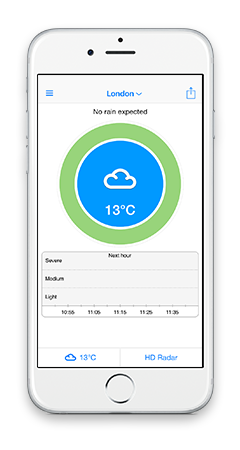 MeteoGroup, developer of the best-selling weather apps WeatherPro, AlertsPro and MeteoEarth, proudly presents its new weather app, from its own innovation lab. 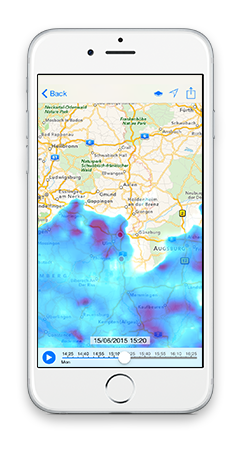 RainToday features real-time rain alerts up to 60 minutes in advance and high resolution radar images! Don't like getting caught in a shower? Be better prepared for the next BBQ party! Get the laundry in before it starts raining! Whenever there is rain expected, RainToday forewarns you in time ! A must have for anyone who spends a lot of time outdoors, whether at work, playing sports or travelling etc. RainToday automatically locates your current position to make sure that all users are dependably warned. You can also manually search for new cities and save an unlimited number of favourite locations. If rain is coming and the app is running in the background (background fetch enabled) an alert will automatically be generated and the app interface will change. 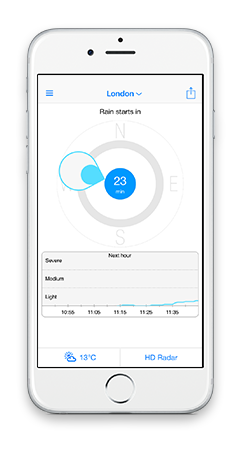 The user will receive all necessary information in one glance, including which direction the rain is coming from, the precipitation amount and how long the rain will last. Even if it’s not currently raining the graph will show whether a shower is forecast in the next 60 minutes. The high resolution rain radar is based on radar images of radar stations, available every 5 minutes. Thanks to high-end technology RainToday visualises intermediate steps with amazing results: smooth animations, pin sharp images and deep zoom for optimal orientation.